What Is The Future For First? I was sent an interesting yet worrying article from passengertransport.co.uk the other day which predicts an uncertain future for First Group following a takeover bid from Apollo Asset Management, a North American private equity investor. Although the bid was rejected, as most preliminary bids are, city analysts are saying First cannot continue in its current form, and the break up of the bus sector is inevitable. 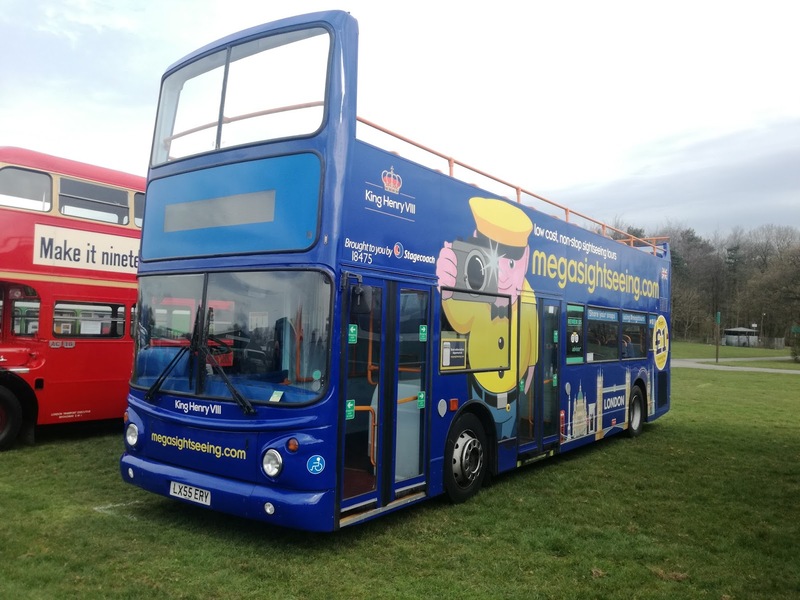 In 2013 shareholders injected £615m into the business, for the purchase of new buses and pay down debt, but have yet to see any return on their investment, and now the task of turning around multiple underperforming businesses was "too big and too complicated". So what can we expect? Well, if Apollo come back with a successful bid the least we can expect is the end of First's involvement in the rail industry, due to political conflictions, and the sale of the worst performing bus businesses. 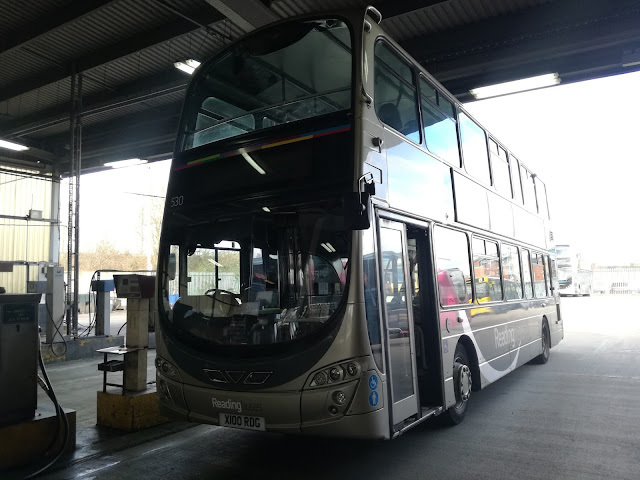 If Apollo fails in their takeover, then according to the analyst " the minimum sales expected are a major, possibly all of, the UK bus business plus Greyhound, both of which require substantial capital investment and management attention". I am reliably informed that First Eastern Counties are one of the better performing bus operations, but one has to assume new owners will want greater profits, so it is a foregone conclusion that loss making routes will go, putting yet more pressure on already underfunded Councils. 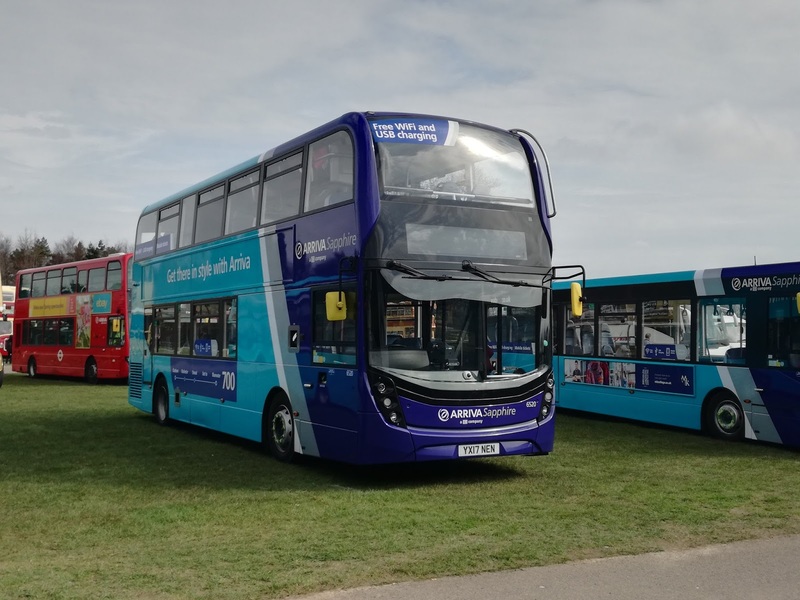 Just today First Essex have announced the axing of several routes in Clacton. 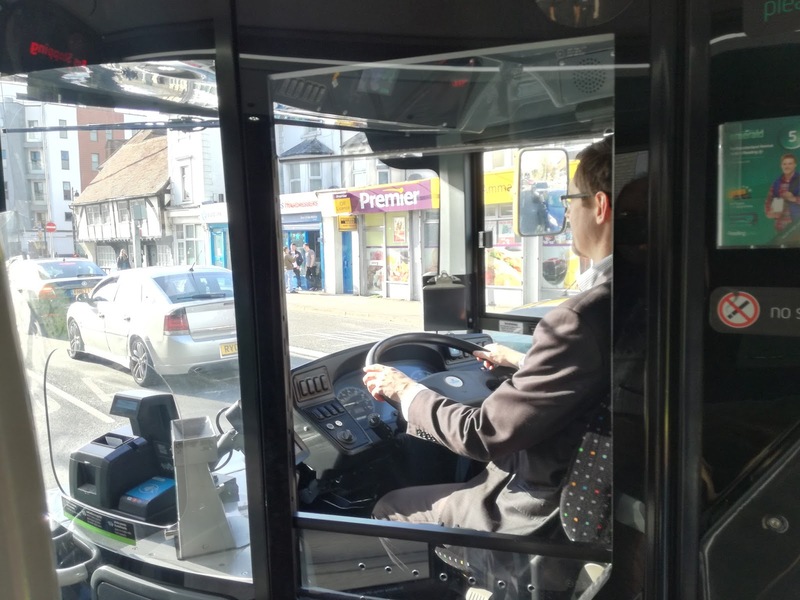 Hedingham have said they will take the routes over but for how long? First won't have dropped the routes if they were making money, and Go East's track record leaves a lot to be desired. If I lived in Clacton I would be very worried. 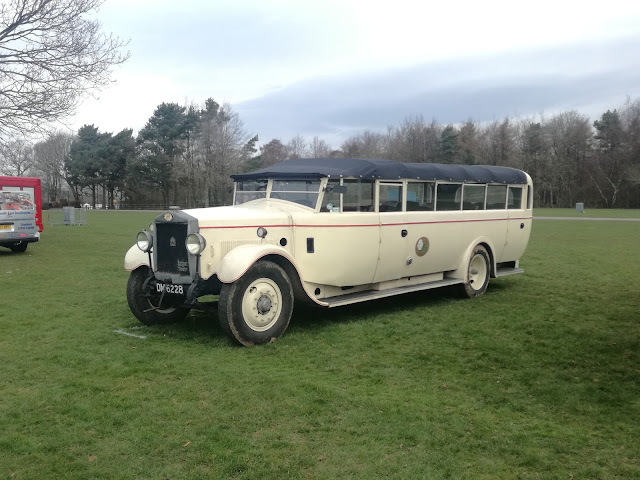 We have seen Stagecoach desert Norfolk, indeed as I write I'm hearing on the radio that Go To Town - part of West Norfolk Community Transport are taking over the 2, 3, 4 & 5 in Kings Lynn. Apparently £1m has been spent on buses, recruiting drivers and opening a new depot. If anyone knows more/has pictures then please let me know. Is the future yet more fragmentation of the industry, with the day of the big boys over? That's not good news if you want to take more than one journey as until there is an integrated ticketing system it will, once again, deter fare paying passengers from travelling. Re-regulation is not a panacea, but it would go a lot further to protect the loss making routes and give motivatioon to make them pay through vision and innovation, rather than just dropping them damning the few loyal users. 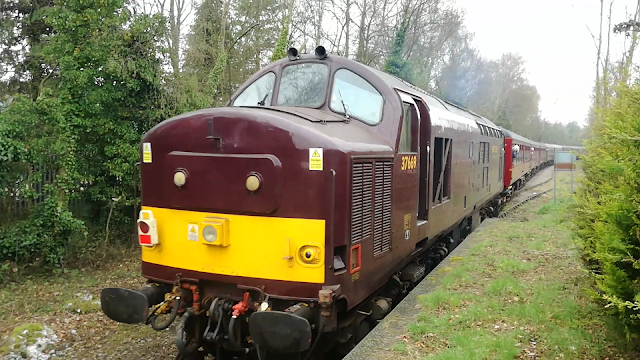 Galloway are doing that in May by withdrawing the 456 and 459 Stowmarket to Diss services. Some villages on the route will be served by other routes, but to quote the suffolkonboard website "Thornham Manor (other than Saturday), Forward green, Wickham St, Mellis and Yaxley will not be served by the current local bus service." Bus users in those villages will be forced onto Connecting Communities, which you have o book days in advance and are not guaranteed to get you where you want to go, when you want to go anyway. Hardly progress. It does make you wonder what the future is if you want to use the bus but don't live in a major town or city. 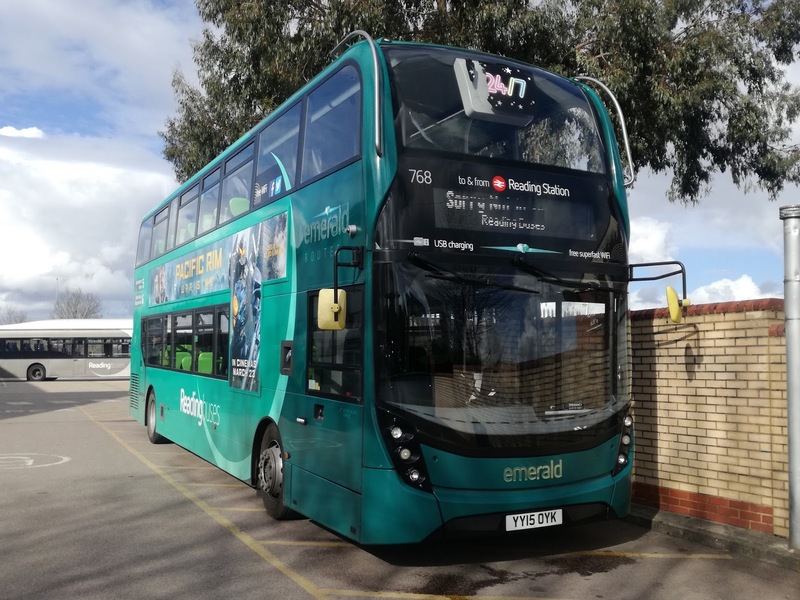 While areas such as Reading, Nottingham and Leeds have seen huge investment and improvement in bs services, inspired by innovative and forward thinking management there are other parts of the country where bus services are in such decline you have to wonder if there is a future at all. If we had a fit for purpose Department for Transport that would help, as maybe a similar system could be put in place such as there is in our schools and hospitals - ie if bus services in an area were seen as inadequate then the area would be put into "Special Measures" where the local authority took the running of bus services over until a recovery was facilitated, with specialist management put in place - like Superheads are at schools. That way the operators such as Reading and Nottingham could keep moving forward, but the operators who couldn't care less about their passengers - not even putting padding in their seats - were brought to book. It will never happen though. So we'll carry on wondering which route the axe will fall on next, and see our bus services continue to erode like the cliffs at Hemsby. We've all done it - get to the station praying that the train is late as usual and of course the day you want it to be late it's bang on time and you watch it disappear into the ether. Normally there's another one you can catch so it's not a total disaster. However had you missed your train to Saxmundham at Leiston on Sept 10th 1966 you would have had extra reason to grumble and bemoan your fate. That's because the next passenger train wouldn't arrive for over 51 years. (edit: If you missed the charter in 2007 that is) Now that's an inconvenience. However on Sunday the wait was over, albeit a charter train. What was meant to be a steam train - The Mayflower - was changed to a Class 37 due to gauging issues, not that I was complaining, and on a very murky Sunday lunchtime it hauled 9 coaches and a Class 47 down the branch from Saxmundham to Sizewell. It was quite a sight although I got the impression many of the spectators - who seem to be conspicuously absent at 2am when the test trains come through - were still expecting a steam loco. 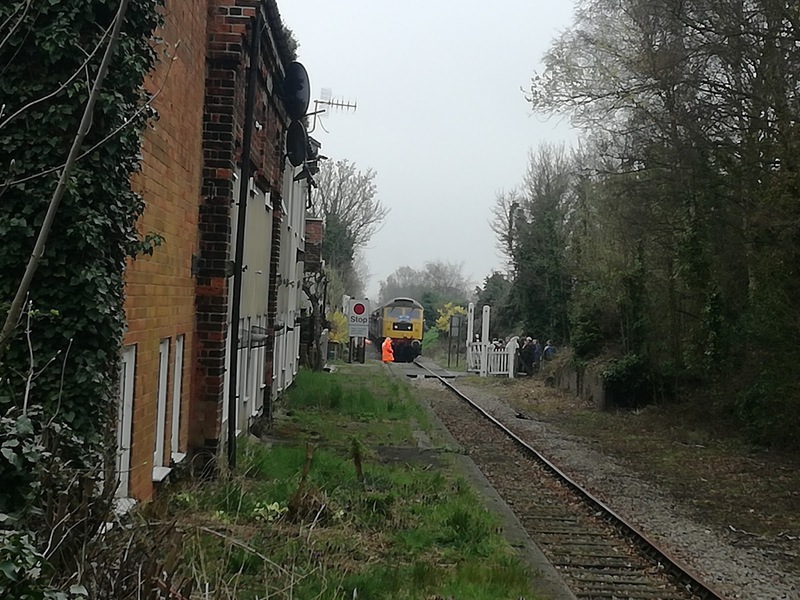 I was at Saxmundham station at midday to see the train glide through. 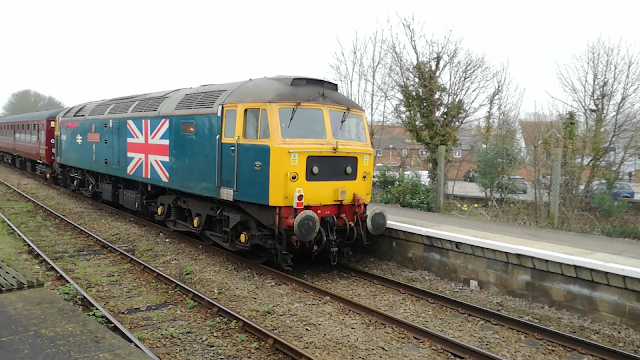 West Coast Rail 37569 leads the Mayflower through Saxmundham. 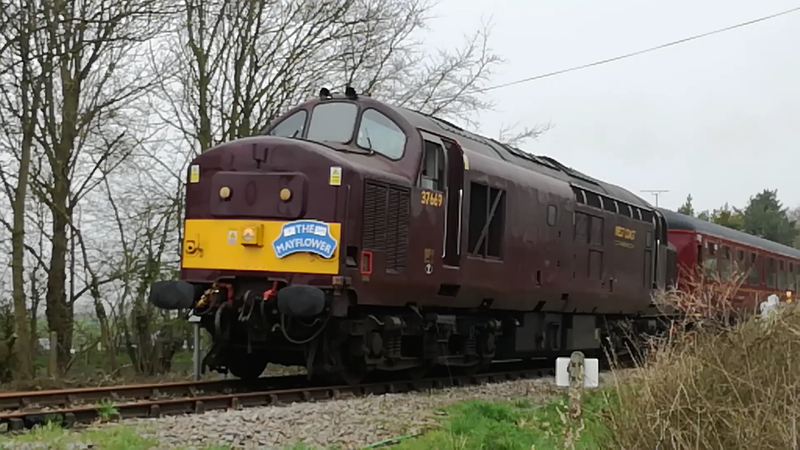 On the rear was 47580 County of Essex, that I last saw in Stowmarket last year. A good compliment to the 37. 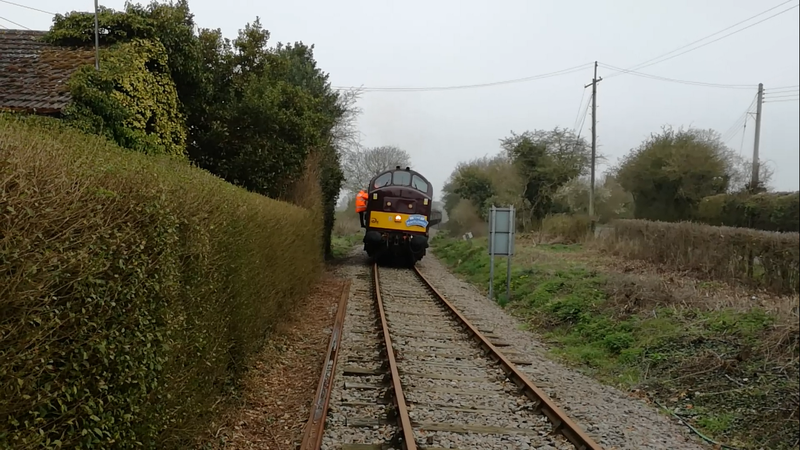 It was time to head down the branch, and I made a beeline to the level crossing that Tim and I normally use to photograph the test trains, only to find that I was not alone and many others had also chosen that spot. Not to worry though, room for everyone as the charter approached the crossing, which has to be manually unlocked and operated. It really was a sight to see the train at this location. Just a shame the sun couldn't make an appearance. And then it came in, the first passenger train at Leiston heading for Saxmundham for over 51 years (edit: Shhh 2007 didn't happen). It felt quite surreal. I just wish I could go back in time to see that station in its heyday, taking holidaymakers to Thorpeness and Aldburgh. 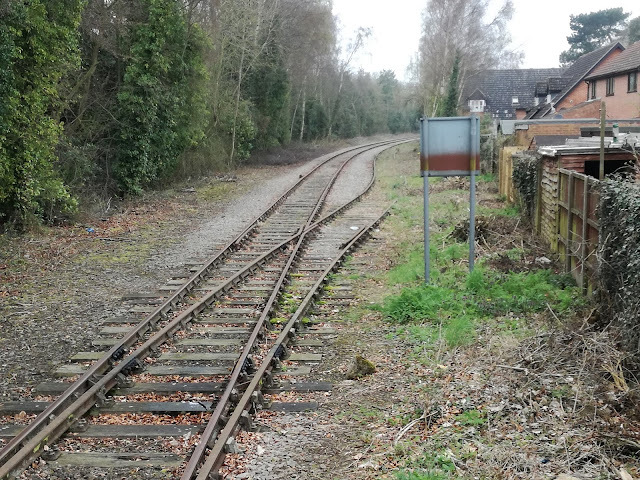 Tim hot footed it to Saxmundham to capture the train heading back up the East Suffolk Line towards Woodbridge. 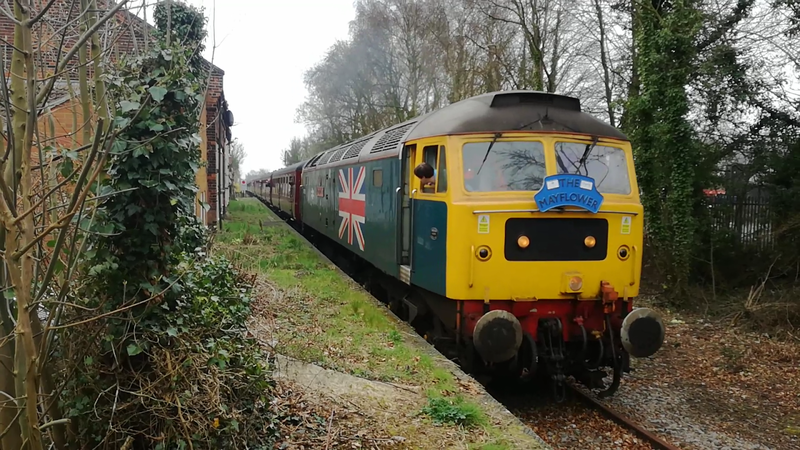 It would be nice if a few more railtour trains headed this way - we have a lot to offer. 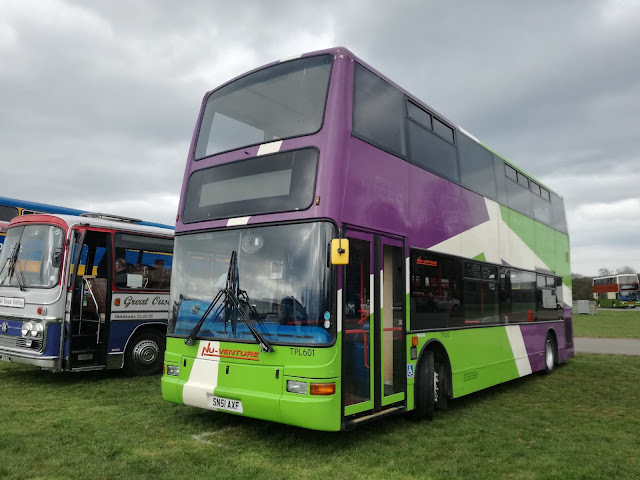 Saturday saw the annual South East Bus Festival take place at the Kent Showground, Detling, and for the first time in 5 years I made it down there. 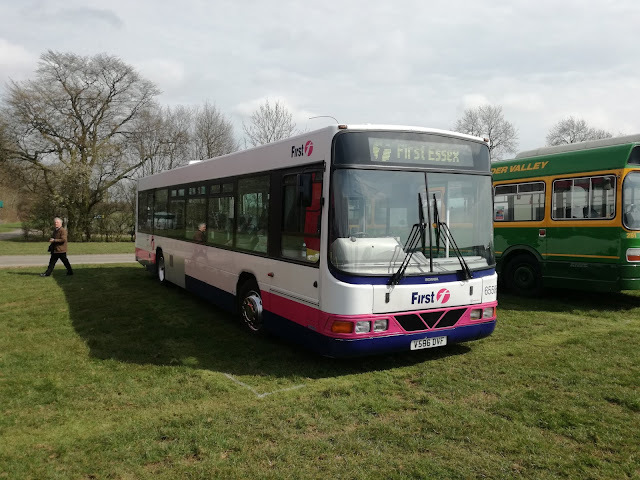 Tim and I had always planned to go, but were given a real bonus when I was contacted on Friday by Ross Newman of Ensignbus, who told me my beloved MD60 was going to attend and would we like to go to the event on it. That seemed a good idea, so by 8am on Saturday I had the pleasure of giving Tim his first Ensign experience, which was typified by a burly fitter approaching us, breaking into a big grin, and making sure we had seen everything there was to see. That's what I love about the place. I know operators who make me take down anything to do with them, or depots where you may as well be met with a shotgun. I'm really happy Tim now knows I don't exaggerate about Ensign and their friendliness. Anyhow, our chariot was already in prime position, and soon Paul Almeroth, the Scania's Head Keeper arrived and did all the preliminary checks, and it was time to go. 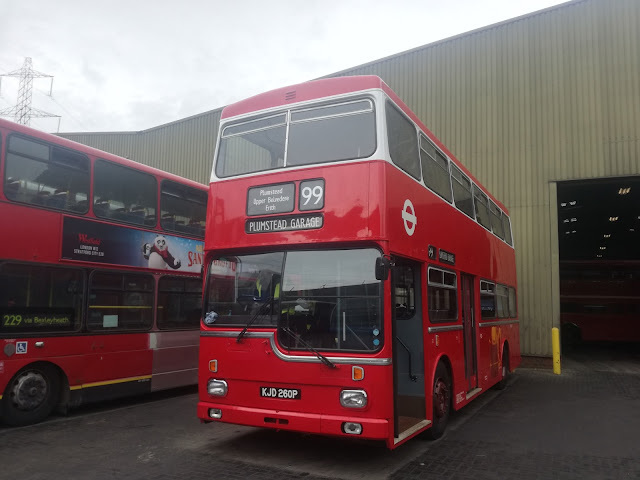 MD60 ready to leave Purfleet for Maidstone. In recent months I have been on MD60 on the Ensign Running Day, a couple of weeks ago in service in East London during the DLR strike, and now on a longer motorway run. Same buzz, same astonishing acceleration and ride for a 43yo bus, and the same regret there aren't more of them in preservation. Long may MD60 survive - it's like looking at the last Dodo knowing there will be no more after this one. 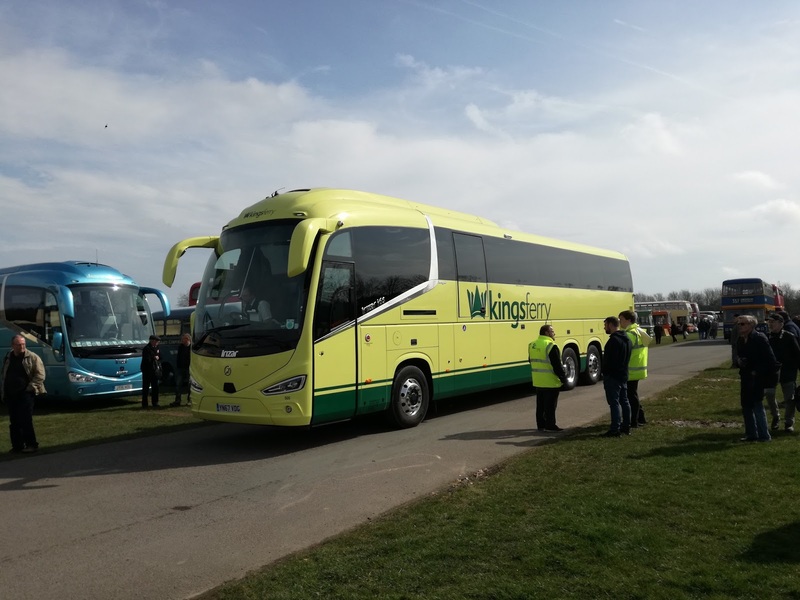 We arrived at Maidstone in good weather for a change, and a showground already full of buses and visitors. As we pulled up the one other bus I was hoping would attend honed into view and my day was already complete. Former Maidstone & District dual purpose Leyland Leopard 2816, OKO 816G is another vehicle that holds personal memories for me, one journey in August 1983 in particular. Now owned by Seaford & District it is wonderful to see her looking so good. I tweeted that I needed Elaine Paige belting out "Memories" whenever I see her. I really do! 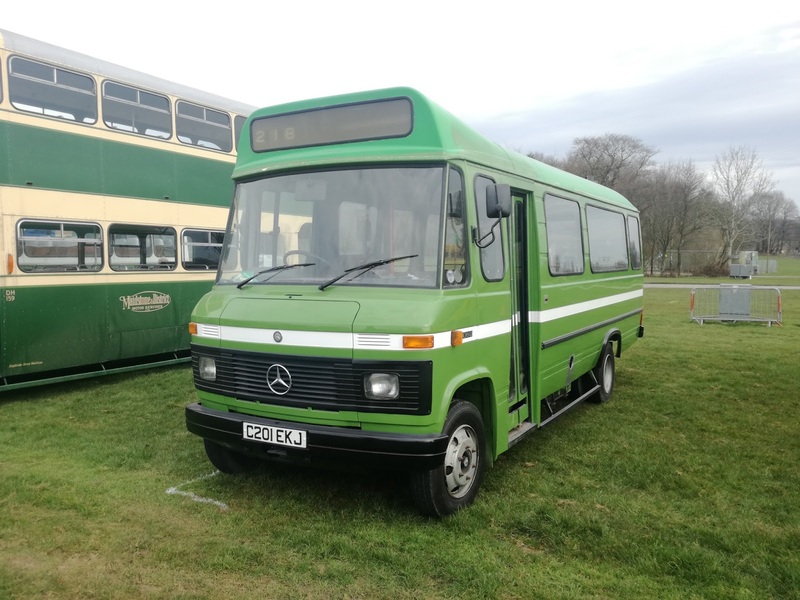 Will anyone ever go as gooey over an E200MMC? Somehow I doubt it! 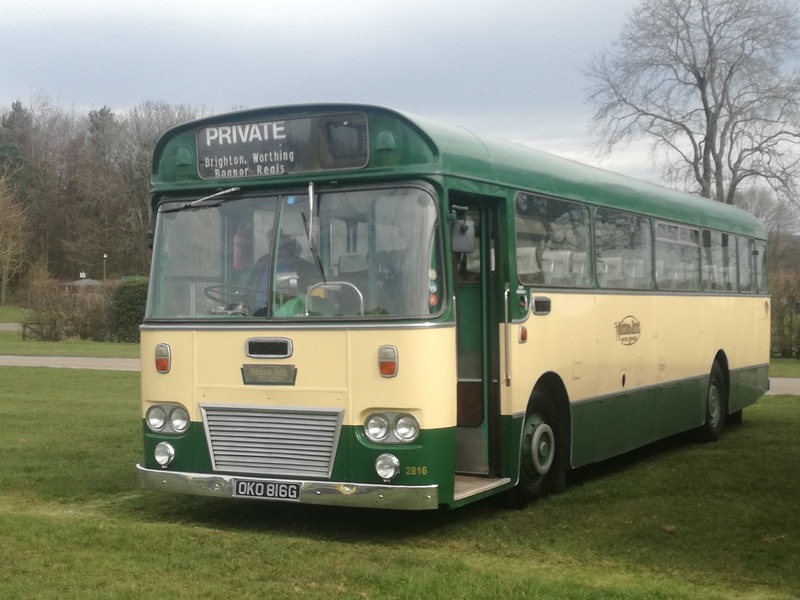 Another ex Maidstone & District bus in attendance was Leyland National 3566 VKE 566S, which is now in private ownership and undergoing a restoration project. Currently in Hastings & District livery it may revert to its original NBC green. It was good to meet Carl Underwood, who owns the National, who informed me that it currently has a Volvo B10M engine. That must sound different! Reading Buses were there, not with their Greenline liveried E400, which is currently awaiting a new engine, but their ex National Express Scania Levante coach. It was good to see Dan again, who was one of my co barrackers on Reading's Top Gear Challenge E400. 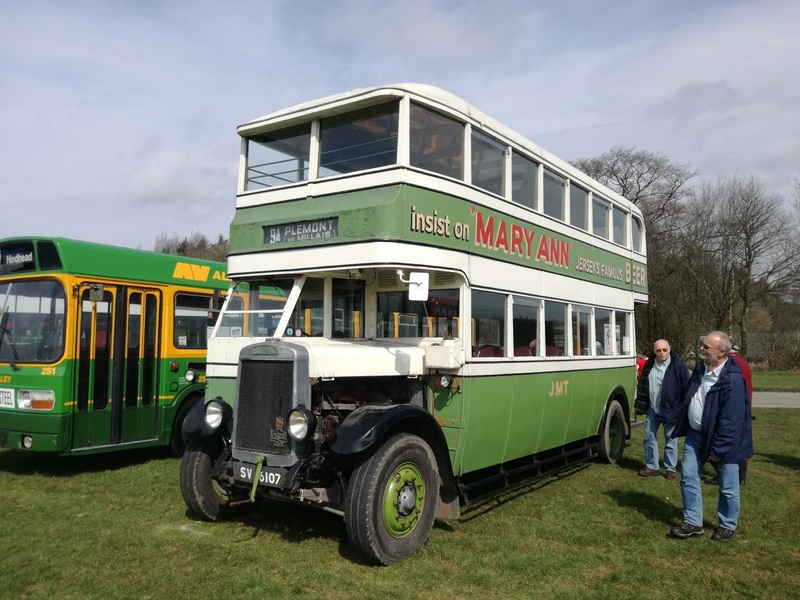 It's not just buses at this event - there are exhibition halls full of vintage cars, bikes, trucks, tractors, fire engines, army trucks and just about anything you can think of. 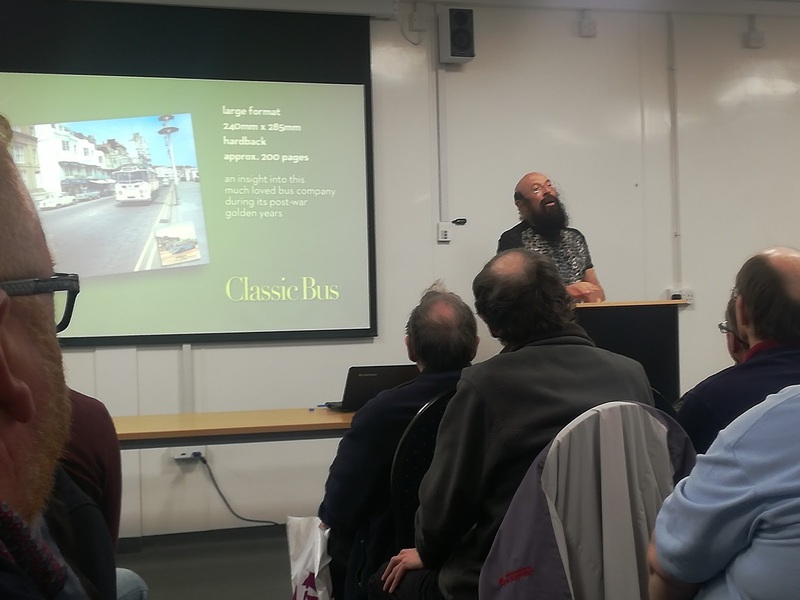 Not only that but hundreds of stalls, so while Tim amused himself browsing the stalls I attended a lecture given by the legend that is Ray Stenning. Who I hear you ask? Well you may not know Ray Stenning by sight - and believe me if you did know him you'd know as he's pretty recognisable - but you will know his work. Ray, with his Creating Desire Team, designs liveries. To name a few you can see his work on every Reading Buses bus, Coasthopper in Norfolk, he was the brains behind the First Multi-coloured front scheme, and Transdev's 36 in Yorkshire. He also designed the livery for East Midland Trains HST's, The VTEC liivery and SWT's livery among others. So I wanted to hear what he had to say, and very interesting it was too, especially when I learned he grew up in Maidstone & District land too. A pleasure to meet you, Ray, and keep up your campaign to rid windows of unnecessary vinyl. 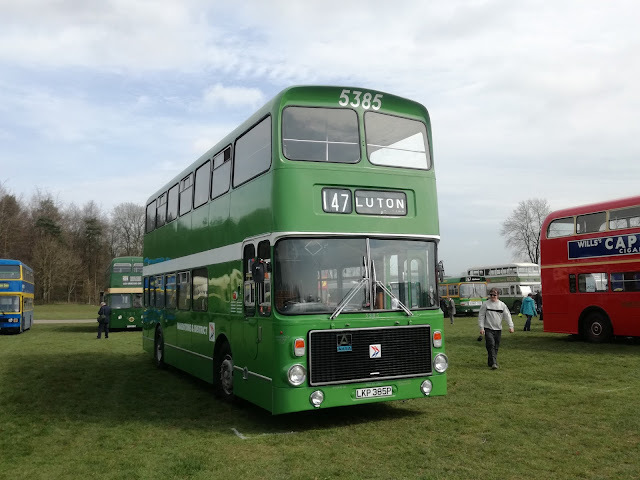 It was also good to meet up with my old friend (older than me by 8 months and always will be) Matthew Arnold of Stagecoach Southeast, and also Kelvin Pinnock, owner of stunning Volvo Ailsa 5385. Actually the green machine wasn't the only Ailsa in attendance, as former London Transport Ailsa V3 was also present. If you remember back to my Ensign post in November you will hopefully remember a bus I featured from Jersey undergoing restoration. Commandeered by the Nazis it is the last petrol engined double decker built in the UK. Well I'm delighted to say the restoration is complete and she's back on the road. It was a really good day, meeting lots of people I knew, and some for the first time. My thanks to Ross and Paul for allowing us to use M60 as a taxi, and Tim for his company. There could be more from Ensign at the end of the week, but I'll leave you with more pictures from the day. 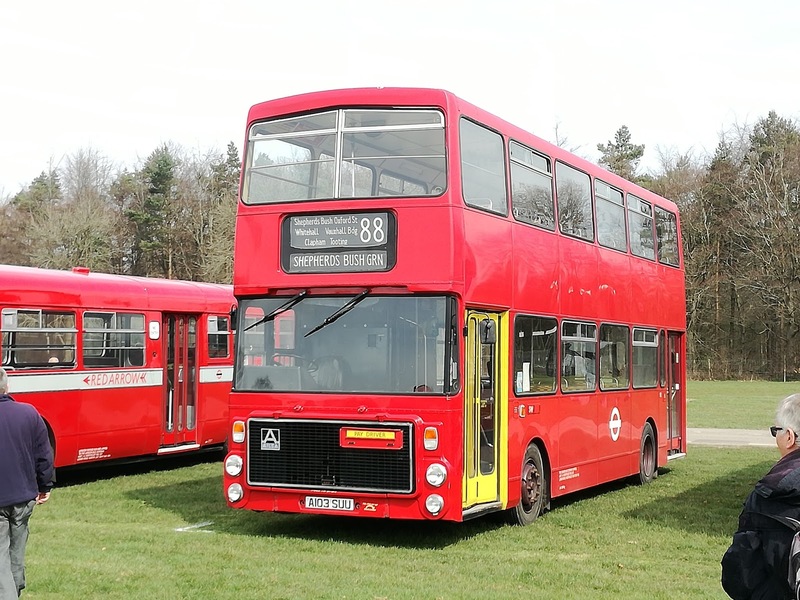 And finally a couple of buses with East Anglian connections. Firstly ex First Norwich and Essex Scania 65586, now part of the Ipswich Transport Collection. And finally ex Lothian and Ipswich Buses President SN51 AXF, now with Nu Venture of Maidstone. 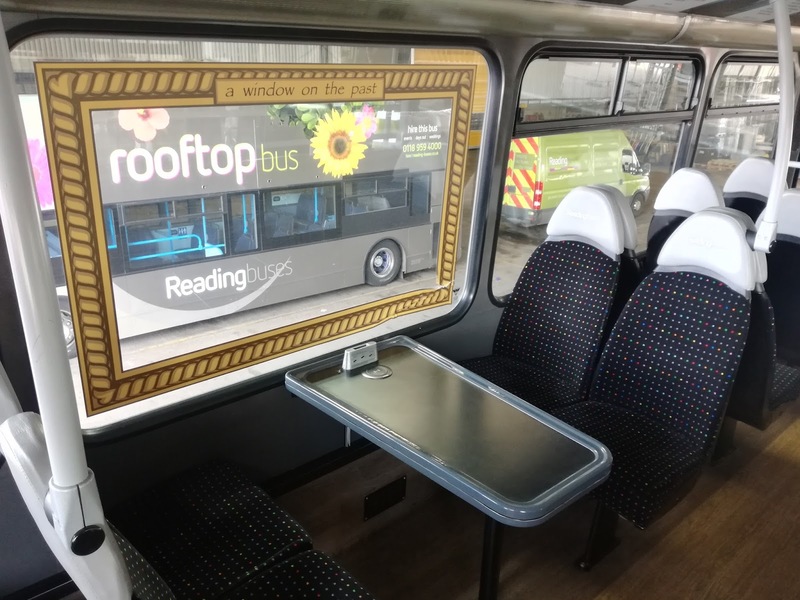 Reading Buses Part Two - Don't Mention The Tape! 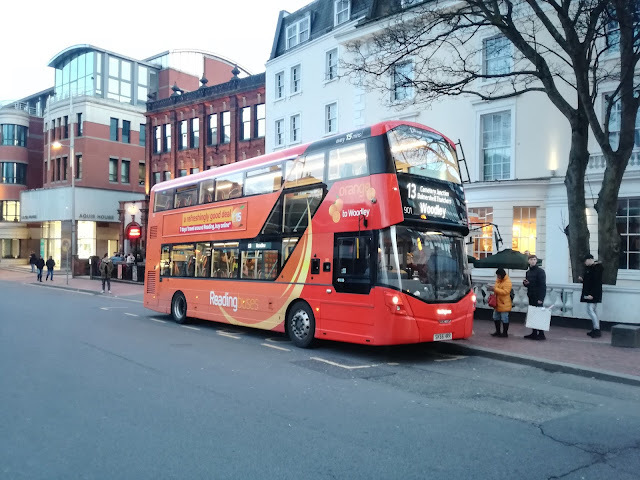 A bit delayed due to the wrong type of circumstances but here is the second part of my visit to Reading Buses a couple of weeks ago. If you can't remember Part One it is here. We left it with your humble blogger being shown around the engineering side of the operation by Head of Engineering & Innovation John Bickerton, who had something he wanted to show me. Tucked away in a corner of a small workshop was a piece of kit that could, sorry - will revolutionise industry. I have never seen a 3D printer before, let alone what it can do, and if I'm honest my head really can't get round the concept or potential. John can, though, and his eyes sparkled with ambition as he talked about possible futures. Vases today but bus parts and panels tomorrow? John can see a future where under the cavernous roof of the main workshop is a band of 3D printers churning out needed parts and panels, reducing the time buses have to stay off the road. 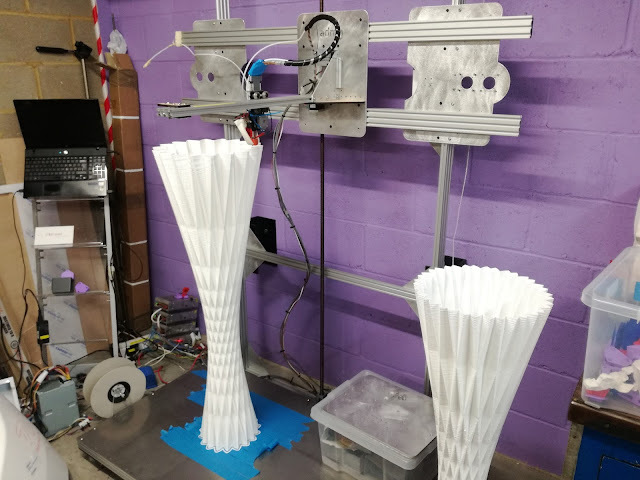 At the moment it's not a quick process - those vases took 18 hours each to print, but then again 20 years ago mobile phones were bricks and internet was still dial up so the future may come quicker than we think. After being shown round the fuel and gas pumps John noted a bus on the pumps and made a beeline for it. It appeared, at first look to be a smart Gemni 2 but all is not what it seems. The front may be Gemini 2 but the rest of it is very much Gemini 1, a 53 reg Gemini 1 to be precise. Not that it looks it inside or out. Like Cityzap in the York/Leeds area they have taken a decent but old body (I know that feeling) and turned it into a new bus. This particular bus is used to encourage student design, and the interior is covered with examples. 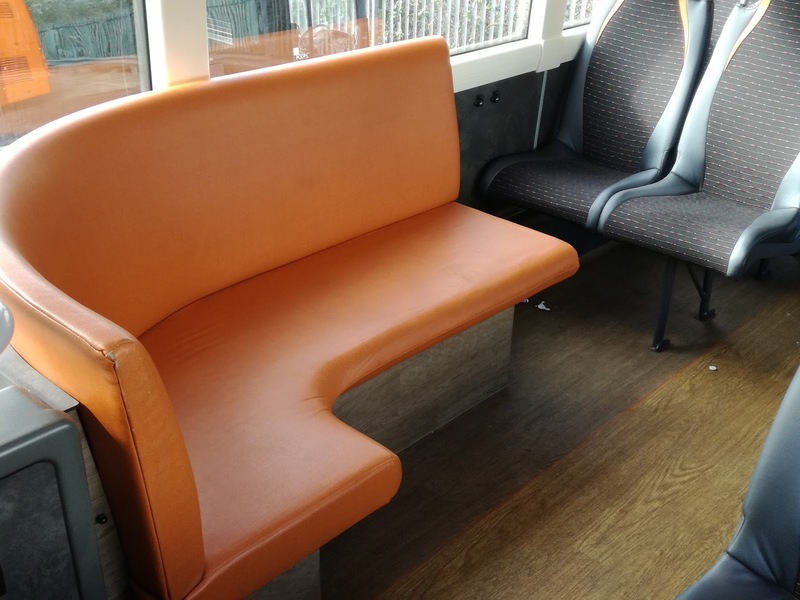 It has tables and a communal seating area, and I'd be very happy to ride it all day! John explained one of the pluses of the tables. 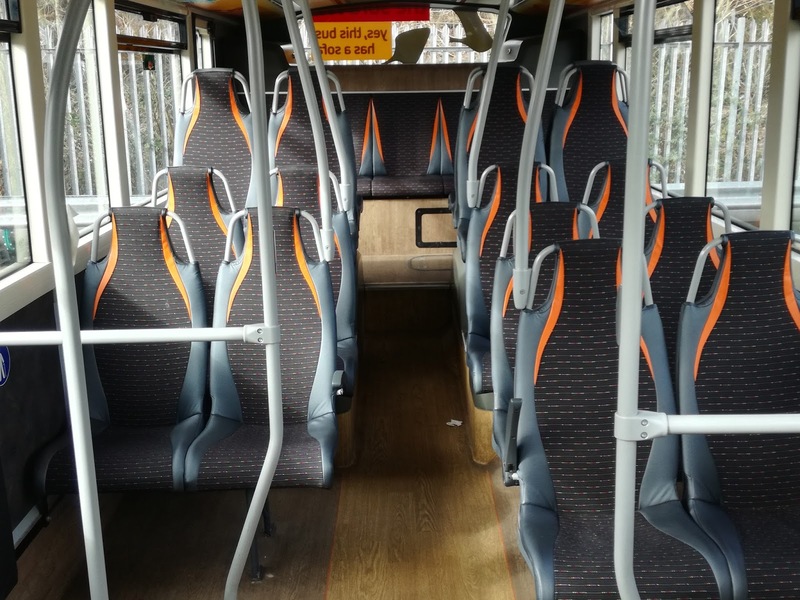 He pointed out that if some passengers were facing the back of the bus it cut down on vandalism and antisocial behaviour. Having the communal seat nearer the front also means those who normally frequent the rear seats upstairs were less likely to. Clever. Incidentally before I was allowed to take that picture, John made sure there was no litter evident and the vinyl on the window was neat and straight. A sign of a perfectionist. Now if you were following my Tweets on the day you would have seen me post a pic of an E400MMC asking why I was about to spend over an hour riding around Reading on it out of service. Here it is. 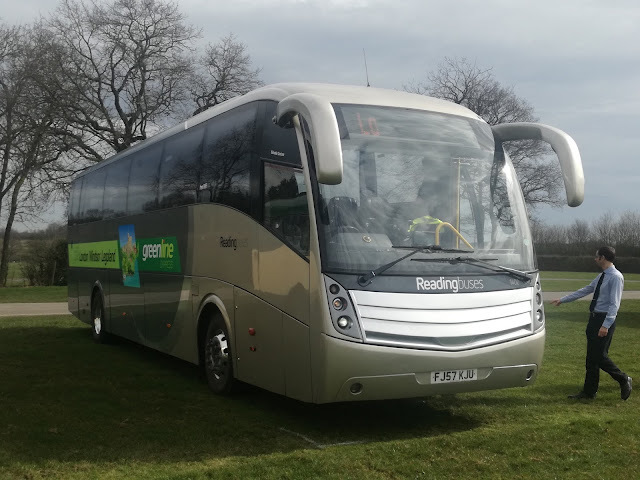 .I mentioned how Reading Buses like to make the staff feel part of one big family. This is a brilliant example. 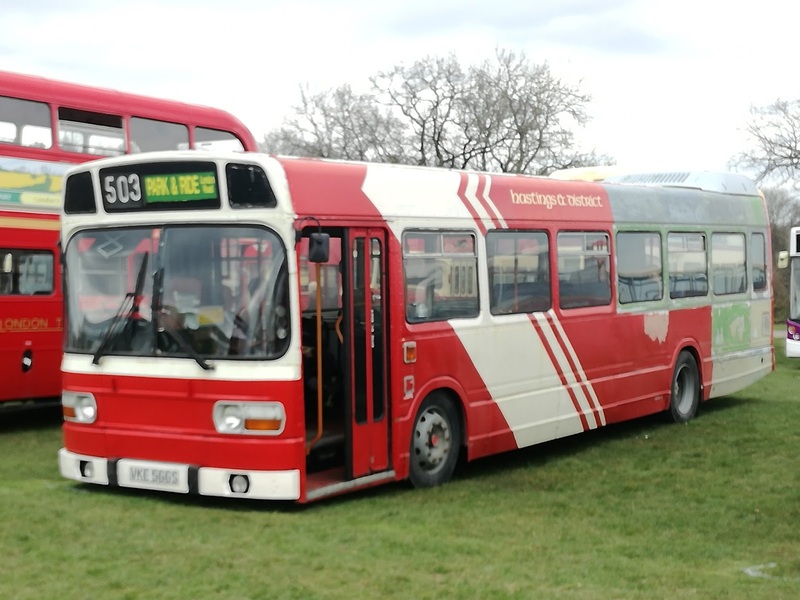 This bus was going to provide the first two "times" of the Reading Buses Top Gear Challenge. Every driver/manager/anyone with a licence has been invited to take an MMC out on a designated lap of Reading, not to see who can do it the fastest, but who can achieve the highest fuel economy. Measured by the telemetics system it is hoped to encourage drivers to drive more economically, which John explained would more than cover the fuel costs of the exercise. What a cracking idea. The only condition is the lap must be done between 0900 and 1500 Monday to Friday so no one can cheat by taking advantage of quiet traffic conditions. 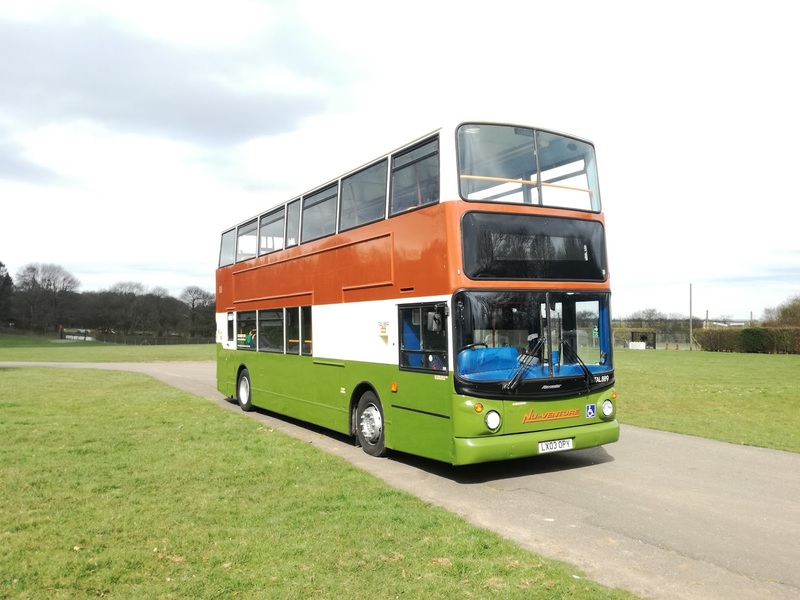 Operations manager David Rouse went first, and considering the heckling he had to put up with from 4 passenger seat drivers, including myself, and the Friday afternoon Reading traffic he did a commendable 8.3km averaging 6.73mpg. Then John showed us how it was done, although it seemed much slower it wasn't, and the clever clogs managed 8.71mpg, setting the bar for everyone else. I have to be honest and I say I have never missed no longer having a PSV licence more than I did that afternoon, as I would have killed to see what I could have achieved. I'll make sure I get the final results. Just another way equality reigns at Reading Buses. Here's John trying to look like a bus driver on his lap! I'm still waiting for the cheque, John, not to publish the first pic I took!!! We adjourned to the control room to get the results, and that was just about it, the end of a wonderful afternoon at a wonderful operator. There was, however, one more thing to do. My dislike of Streetdecks is well known, but both Martijn and John have always emphasised that their Streetdecks, complete with Sofa and tables were rattle free. I had to try one out, so before I caught the train back to London I did a circuit on the 13 with my most critical hat on. I started off on the sofa, a funky communal seat behind the stairwell. Specially designed material to feel like the peel of an orange - it actually does - I found it very comfortable. The other seats aren't what you'd call sumptuous, but unlike new train seats I found the longer I was sat the more comfortable they felt. So of course the big question is do they rattle? Were the claims accurate? Well much to my surprise the claims were proved accurate. It didn't rattle. in fact the Streetdeck gave a cracking ride. No, that's not an April Fool as I'm not doing one this year! I thought I'd found evidence as to why they didn't rattle. I took this picture, and tweeted it congratulating everyone for noticing and dealing with rattles. As a massive anti-rattler I was impressed. However, the reaction to that picture was akin to the reaction in Monty Python's "Dirty Fork" sketch. What? Gaffer tape on one of our buses? You're joking - which bus is it, it's coming off the road now! We only have gaffer tape behind glass for emergency use only! 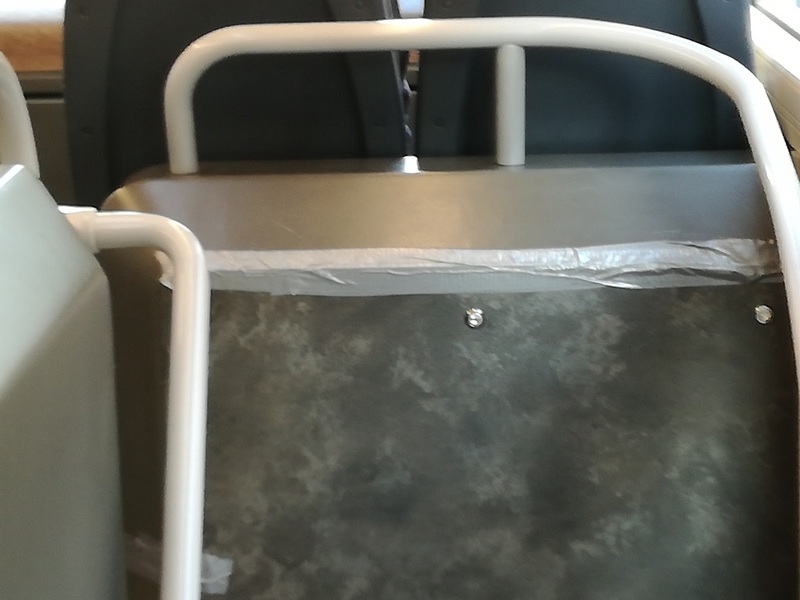 It would appear that the rule is something like "Our buses shalt not rattle, but not by use of gaffer tape". And that rather sums up Reading Buses. no corners are cut, and if something's going to be done it is done properly without the use of gaffer tape! Most operators would have accepted the compliment about paying attention to rattles. Actually no - most operators wouldn't have given a damn about the rattle in the first place, let alone deal with it, let alone be horrified at how it was dealt with.